U Can't Anvil The Truth: Did Richard Hammond Drive His Toy Electric Car Or Was it Radio Controlled?? Did Richard Hammond Drive His Toy Electric Car Or Was it Radio Controlled?? Richard Hammond Explodes Electric Car???? Former Top Gear host Richard Hammond is airlifted to hospital after flipping £2million supercar in horror crash during filming of Amazon show. 47-year-old is being treated in hospital after flipping £2million electric supercar. It comes after he sustained brain injuries in 288mph rocket car accident in 2006. 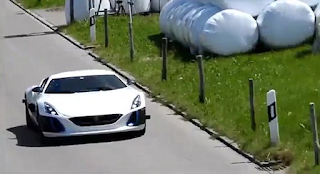 Pictures from the scene showed the Rimac Concept One in flames. Grand Tour producer Amazon later released images showing the burnt-out wreckage of the vehicle laying upside down on a hill. Maybe it's just me but when does a electric car explodes in a ball of fire???? The driver was, in my mind, a radio controlled device so nobody was injured and hospitalized.